abbi can be used in various ways. Via the abbi research community app, via a browser that also allows you to chat with abbi on your computer or bring abbi 'inside' by integrating her into an existing app or platform. Would you rather use abbi by app or browser? I prefer the abbi app. If we would release an abbi app, what are the chances you're going to use it. For insights communities an app solution is preferred to activate research chats among participants using hybrid messaging. For more one-off research questions abbi also offers a browser solution which can be activated with a QR code or by sending a link to take part in a chat. With the app solution you can opt for 'white label' integration of the chatbot and chat engine in an existing app or for using the abbi app, which can be adapted to your own branding. Just what works best for your organization. You can also choose to recruit and register your community on a landing page or directly on your website. For ad hoc surveys you can use a link from a web page or e-mail. The chat questions can then be answered immediately without having to install the app and can also be used for chat research on desktop or laptop. A QR code connects the on and off line environment. 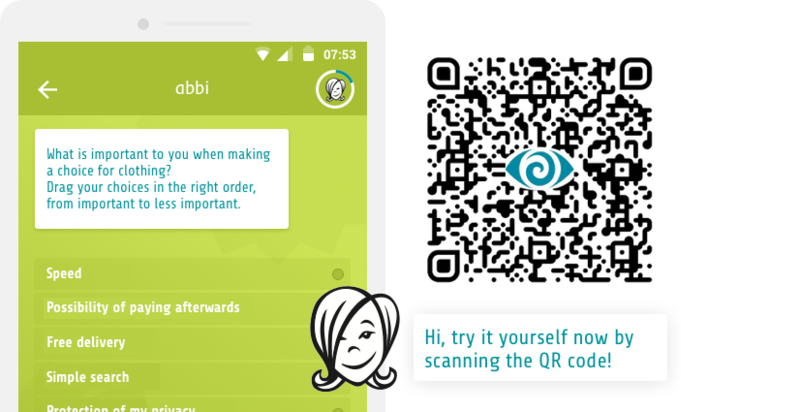 By scanning a QR code respondents instantly enter a number of chat questions. You can, for example, place the QR codes at the exit of shops, on a big screen for live voting and quick polls during events or for congress evaluations. Or have it printed in a magazine or on your product or invoice. This activation method is particularly suitable for recruiting community members and for activating location based ad hoc research among respondents. If you want to connect with the same group of respondents on a regular basis from a research community and you do not have an app yet, you can easily do this with the abbi app. This is easy to tune into the look and feel of your own organization, but the technology behind the abbi app is identical. You will always benefit from the latest innovations and updates. If your organization already has its own app or platform, you can easily integrate the abbi chat research solution with an API solution. This makes it possible to use the abbi chat engine and chatbot within your own app environment or online platform so that you can receive real-time feedback from your own customers, members and other stakeholders in an innovative way, using the mobile abbi technology at the moments that matter. Passive behavioral triggers like geolocation recognition and payment data can after all be utilized to activate chats. Want to know more about the app, web or API solutions of abbi insights?